Always looking for a good book! Time for another Classic spin. It is a favourite challenge of mine and guide me towards reading the classics. I have updated my list with five new books, since I managed to read a few classics outside the last spin. I am happy about that. Here is my updated spin list. My 50 classics list is here. I am nearing the end with these last 20 books, so will start a new list. Looking forward seeing which book will come up and what you are given to read. 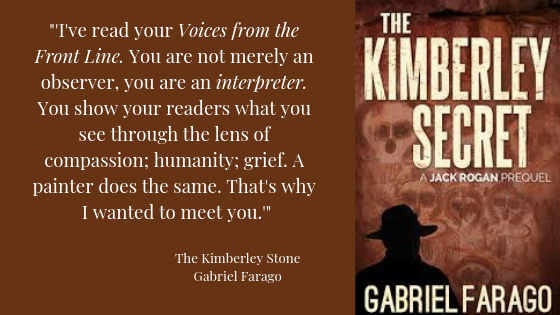 The Kimberley Secret is a prequel to Gabriel Farago's Jack Rogan Mysteries' series. After four books it seems his audience wanted to know the background of journalist Jack Rogan, on his quest to solve historical mysteries. Luckily, for me, it is the first book I read, receiving it as a free gift from the author via Booksweeps. However, I think you can read the books in any order. Jack Rogan is a successful war correspondent in Afghanistan, when he receives a phone call, telling him his father is dying. He hurries home, just to get the chocking news that he was adopted as a young boy. The whole adoption process is rather mysterious, so Jack Rogan sets out to find out who his parents were, and where he comes from. What I find so attractive with this book, is that it is an old fashion mystery of a kind we seldom meet these days. There is a mystery, a riddle to solve, and clues that lead you further and further into the story and its solving. Not necessarily a murder. Or maybe, just one, passing by in the outskirts of the story, but not to be diminished nevertheless. His trail takes him to unexpected places. They lead him back into Australia's wilderness, to forgotten history and stories and on a global trip where he finally finds an answer to his own background and who he is. It is a charming story about a charming man. An enjoyable easygoing read, with history surrounding the story, and told very well. It has a little bit of Agatha Christie style over it, or those mysteries written earlier in the 20th century, that we love so much. Far away from the sometimes very violent detective stories we get today. I am now going to read Professor K; The Final Quest. What better stories to read while travelling? Sometimes you open a book, of which you only have a summary of the plot. You read the first chapter and you are lost in the story. It does not happen often, but here is one story that captivated me from the very beginning. A couple of chapters later, I never wanted it to end! Well, you do want even a good book to end, but I think you understand what I mean. The Bahamas, 1941. Newly-widowed Leonora “Lulu” Randolph arrives in Nassau to investigate the Governor and his wife for a New York society magazine. After all, American readers have an insatiable appetite for news of the Duke and Duchess of Windsor, that glamorous couple whose love affair nearly brought the British monarchy to its knees five years earlier. What more intriguing backdrop for their romance than a wartime Caribbean paradise, a colonial playground for kingpins of ill-gotten empires? Or so Lulu imagines. But as she infiltrates the Duke and Duchess’s social circle, and the powerful cabal that controls the islands’ political and financial affairs, she uncovers evidence that beneath the glister of Wallis and Edward’s marriage lies an ugly—and even treasonous—reality. In fact, Windsor-era Nassau seethes with spies, financial swindles, and racial tension, and in the middle of it all stands Benedict Thorpe: a scientist of tremendous charm and murky national loyalties. Inevitably, the wilful and wounded Lulu falls in love. Then Nassau’s wealthiest man is murdered in one of the most notorious cases of the century, and the resulting coverup reeks of royal privilege. Benedict Thorpe disappears without a trace, and Lulu embarks on a journey to London and beyond to unpick Thorpe’s complicated family history: a fateful love affair, a wartime tragedy, and a mother from whom all joy is stolen. The stories of two unforgettable women thread together in this extraordinary epic of espionage, sacrifice, human love, and human courage, set against a shocking true crime . . . and the rise and fall of a legendary royal couple." 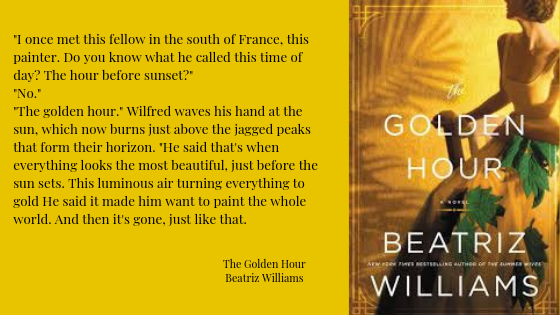 The Golden Hour tells a story of suffering, love, spies and treason, even murder. We are presented with two stories; about Lulu and Benedict Thorpe, and a parallel story of Thorpe's parents (a German woman, Elfriede, and a Scottish man, Wilfrid) meeting in the beginning of the century. How they meet and fall in love, and how their personal circumstances make a relationship difficult. Hers is a story of suffering and complicated family history. He is a soldier. And then comes World War I. Where does love take them when their countries are fighting against each other? The "present" story is set against the tropical scenery of the Bahamas in 1941-43. It is inhabited by a society with 'runaways', with or without money, using it as a haven during troubled times. Old aristocracy, rich businessmen and the Duke and Duchess of Windsor, the center of society and its intrigues. Lulu Randolph arrives in order to write a society column for a New York magazine. Preferably, about the Duchess and her life. Lulu is trying to come closer to the couple, but it seems rather impossible. Until one day the Duchess is approaching her with an offer she cannot refuse. When Lulu meets Benedict Thorpe, a friend of the Windsors, she has no idea of who he is, his complicated family history, or for that matter, his mysterious work. He might not just be the scientist he makes you believe he is. Worried times also hit the Bahamas, and under the perfect surface, something looms. A mystery, murder and spy story slowly develops. And then, after a passionate romance between Lulu and Benedict, he suddenly disappears. "He said that's when everything looks the most beautiful, just before the sun sets. This luminous air turning everything to gold. He said it made him want to paint the whole world. And then it's gone, just like that." There is a mixture of real time events as backdrop to this exciting story. The life of the Windsors after the abdication of the Duke in 1936. A sort of restlessness in their lives. Maybe the same restlessness that seem to possess many other persons staying in the Bahamas during the war. It seems everyone is waiting for something. But what? A wealthy businessman Harry Oakes is mysteriously murdered. The Duke of Windsor, being the governor, initiates an investigation that leads to unexpected results. Rumour has it that the investigation is poorly executed, leading to more rumours. For all fans of historical fiction, this is a perfect story. It is a story about two strong women, trying to find their way in the world. Both stories are as fascinating. Fighting for their loved ones, over years and continents. I love how Beatriz Williams has managed to merge her own, exciting and mysterious story, with real life events. It is well written and reflecting the times. She moves comfortably in the circles she is writing about. It is exciting, especially when you realise that the outcome is not what you expect. There are several twists at the end of the story. Amazing and fantastic. Just love it! Beatriz Williams is the successful author of several novels of historical fiction. You can find out more about herself and her books on the link above. I am already looking for another one of her novels. "Here Doerr tells, in luminous prose, the story of David Winkler, a man graced with the gift of premonition and plagued by a dream that foretells his daughter's death. He flees thousands of miles from his family and home in a desperate hope that his dream will not come true. 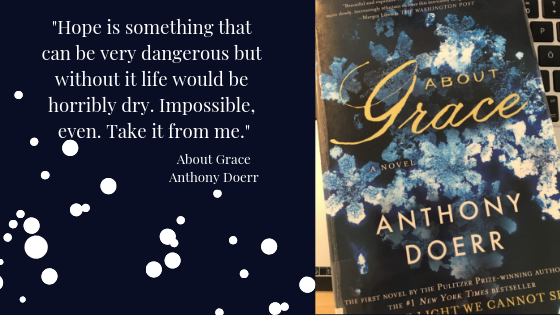 Set in Alaska, Ohio, and the Caribbean, About Grace is a heartbreaking, radiant, and astonishingly accomplished novel about the tiny but lifesaving miracles happening around us at each moment, and about our longing for grace." "Did time move forward, through people, or did people move through it, like clouds across the sky?" "What is time? he wrote in his pad. Must time occur in sequence - beginning to middle to end - or is this only one way to perceive it? Maybe time can spill and freeze and retreat; maybe time is like water, endlessly cycling through its states." After his flight from his family, David Winkler ends up in St Vincent, with Felix and Soma and their children. They are refugees from Chile. He is welcomed into their family, and he creates a special bond with their daughter Naaliyah, who is the same age as Grace. He is a scientist and has a special interest in nature. In Naaliyah he finds a soulmate, and he teaches her on how nature is working. They become his new family. When, finally, after 25 years, he decides to go back and find out whether his wife and child are still alive, his life turns into another loop. During the 25 years in the Caribbean he let life lead him wherever it took him. "The inn itself began to slump, as though it had simmered too long in a covered pot." The same could be said about himself. Finally, he takes his life in his own hands. Or, does he really? Is he not just moving into another timeframe and continue to let life take the lead? "He marvelled at the indifference of the world, the way it kept on, despite everything." He decides to go looking for Sandy and Grace. Like in his earlier life, he is once again pushed around by life rather than by his own decisions, maybe guided by his fears of what he will find. "To enter a world of shadows is to leave this world for another." Failing to find his family, he goes back to Anchorage where it all started. "It was as if her vigil from the boat shed, decades earlier, had begun anew. In his clearer moments Winkler wondered if, sooner or later, every event recurred, if life consisted of a series of repeated patterns: the scar on his knee; now an injury to his foot. Viewed from above, maybe lives looked like matrices of color, scarves on a loom. He wondered: When I wandered out of that town, heading toward the airstrip, was I planning on coming back? Or was I trying, as I did with Nanton's rowboat, to let the world take me?" There are a lot of layers in Winkler's story and life. Must family be blood bound, or could family be accidental. Could you be considered a family, living among friends, sharing their lives, their children, their sorrows and happiness? Being part of some kind of unity. Is life taking us on a ride, or is it possible to control it? Can we change our destiny? "But what was family? Surely more than genes, eye color, flesh. Family was story: truth and struggle and retribution. Family was time. " "But there was a worse feeling: the possibility that it didn't matter what he had done, that outcome was independent of choice, that action or inaction, no decision mattered, and his entire attempt at family was now dead and nobody was left to care whether he gave up or kept on." I started saying this is a very sad and tragic story. It is. Part of the time I was irritated with Winkler and his lack of action. Why does he not speak up? Why does he not take his life in his own hands? What is he waiting for? As I said, not an easy read. Having finished the book, it did stay with me, made me face the big questions in our lives. Who are we? Are we able to control our actions, or are we bound by destiny? What have we become? And why? And how does time affects our life? Is there any hope for Winkler in the end? I was really hoping there was, but will not spoil the end for you who intend to read it. The book is definitely worth reading, if not solely for the story itself, but also for the prose, the thought provoking comments and a look at life from another angle. The beautiful prose, which makes the novel a pleasure to read, in spite of the difficult story. Just look at the quotes here. Much more where these come from. A book that has been on my shelves for a very long time. I read it for the Book Challenge by Erin, as a "book that has been made into a film". It was filmed with Ingrid Bergman and Gary Cooper, directed by Sam Wood. I have been trying to watch it, but am not able to find it anywhere (at least not for streaming). It is a great read and has a lightness about the story. 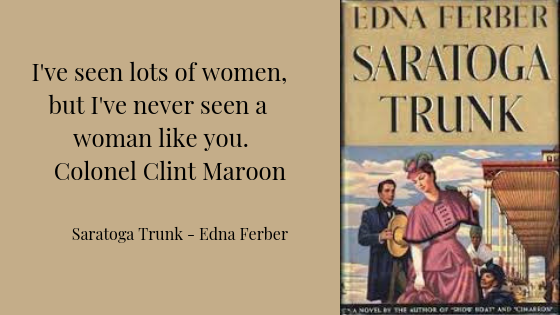 The novel starts in Saratoga where Colonel Clint Maroon and his wife Clio Dulaine attend the Saratoga season as usual. They are now in their 80s and still the most popular persons during the season. This year Clint Maroon has decided to tell the truth about himself and his wife. However, the gathered journalists do not want to hear. They just see the successful, beautiful couple, still in love with each other after all the years. Instead, Ferber tells us the story of how Clio Dulaine, an illegitimate daughter of an aristocratic New Orleans Creol father and his beautiful mistress Rita Dulaine. When she happens to kill her lover, she, her sister and daughter have to leave New Orleans and Clio grows up with her mother, aunt, the maid Angélique Pluton and a dwarf manservant, Cupidon in Paris, France. When her mother and aunt dies she decides to go back to New Orleans. The somewhat mixed family enters, Clio moves in and renovates her mother's old house and settles down to become a nuisance to her father's family. There is a half sister ready to go out into society. Clio needs money and she knows how to get it. She very soon meets a cowboy, Clint Maroon; tall and handsome who falls for Clio. Clio sees something special in him and they start a relationship. He lives on gambling and day by day. Clio has a more settled situation in mind. She wants to marry rich and not have to worry about anything more in her life. Together with Maroon they plan a sejour during the Saratoga season. Clio is pretending to be a widow of a French aristocrat, Maroon is there as himself. In Saratoga the crème de la crème meets during the season, and there are not shortages of eligible, rich bachelors. Clio plays out her scheme as the full feathered actress that she is. It is a totally charming story, intermingled with the fight for the control of the lucrative railway lines, being constructed at the times. It is exciting and as the people gathering in Saratoga, with gossips, relationships and a place at the top, they await the next move from Clio, as is the reader. This is the first book I have read by Edna Ferber, and it makes you want more. It was published already in 1941, but the writing is easy and charming. The story grows slowly, and although you do know the end of the affair, she manages to capture your attention for the whole of the novel. It makes for more. I see some titles of her that I will try to find; So Big (won the Pulitzer Prize), Show Boat, Cimarron, Come and Get It, Giant, Ice Palace. I think some of these titles have been made into films as well. This is the first book I have read by Jo Nesbø, so I can't say whether it is a typical book of his. I suspect it might not be. The title itself reveals what the story is about. Nesbø has used the Shakespeare play as a base for his own story. It is not set, as the original, in 11th century Scotland, but in Norway in a near, somewhat dystopian future. I was not familiar with the plot of Macbeth and took some time off from the book to read it. It seems that Nesbø uses it almost to the point. Instead of a fight for the throne of Scotland, we face a fight for the post as head of the police departement, or even as the mayor of the city, which is the highest post. We find all the characters and names from the original play, and it is masterly adapted to modern times. Macbeth's role in the police is head of the Guards. They come in to clean up the mess, and uses more violent terms to do it. His Lady is the head of a luxurious casino. When the corrupt chief of police is killed a new era is to begin. Duncan, the new head is honest and wants to fight the corruption that holds the city in a grip. Macbeth is a popular guy, maybe because he has stayed where he is. He had a complicated and difficult youth with drug abuse. Clean since several years he prefers to stay where he is. There are two big drug gangs in the city, fighting for survival. Especially one of them, called 'The Hand', is fighting to take control of the city in his own way. 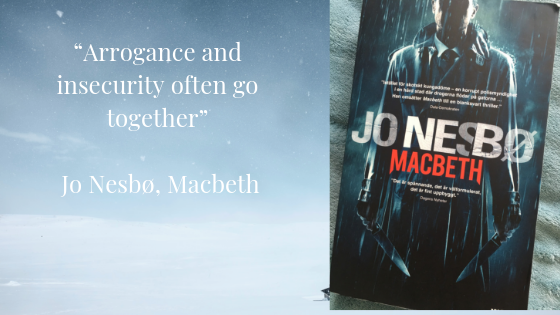 He knows how to manipulate people, as does Lady, and when he lets someone whisper in Macbeth's ears that he could become the next chief of police if he gets rid of the present one, Macbeth's mind starts working. With the help of Lady. One murder leads to the next. Power corrupts they say, and this story clearly shows it. It becomes a rat race to plan the murders and then to cover them up. The more murders, the more cover ups. In the end you are stuck in a corner and there seems to be no way out. The adaption of this story into modern times works very well. It shows us an angle that we understand. The 11th century is far away, times were different and we might not really be able to put ourselves in those times. But, when we read about our own time, the story becomes more sinister. An excellent thriller, well written and difficult to put down. 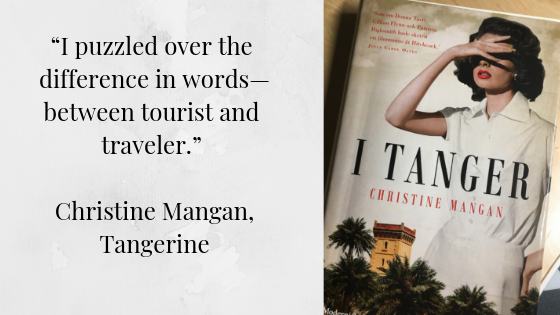 This is Christine Mangan's debut novel. And what a debut! A psychological thriller that makes it hard to read sometimes. It is like a nightmare. Alice and Lucy are the two protagonists who became friends during their studies at Bennington College. They shared a room and they stuck to themselves. The story starts in 1956 in Tangier, where Alice and her husband John live. Every other chapter is narrated by Alice and Lucy. We get hints that something happened back there in college, which destroyed their friendship, but it is only later that we learn what it was all about. It is difficult to tell the story without spoilers, so just a few thoughts about it. Most of the story takes place in Tanger where Alice is living with her husband. One day out of the blue Lucy shows up. Alice lives with a trauma from her parents' death, and her life is always affected by it. While Lucy takes in Tangier and its atmosphere from the beginning, Alice is spending her days at home, dreading to venture outside. Lucy manages to help Alice to regain a little bit of her confidence and they discover Tangier together. This is a story about a friendship during the college years. However, there comes a day when it is not enough for one of them, and this is when a problem arise. It is a story that captures you. All seems fine until you realise that all is not what it seems. One have the same claustrophobic feeling as when reading Daphne du Maurier's Rebecca or is watching Gaslight with Ingrid Bergman and Charles Boyer. In the end you do not know who is telling the truth. Who is sane and who is not? I found it difficult to read once I realised what it was all about. Nightmarish! Manipulation can take you a long way it seems, and it is difficult to discover if the person is very good at it. Wherever you turn, you loose! A marvellous debut book by Christine Mangan. From Harper Collins Publishers' website I read that she has a PhD in English from University College Dublin. Her thesis focused on 18th-century Gothic literature, and she has an MFA in fiction writing from the University of Southern Maine. Although you can not say that Tangerine is a Gothic novel, it has some of the gothic feelings. Something which is just a feeling and not always visible. Lingering in the air, and by the time you realise what is going on, it is too late. As always a pleasure to read Julian Barnes. His books are different but have so much to say. He writes a 'biography' which is not an ordinary biography. He mixes the biographic element with some fiction and some literary critics. It does become very fulfilling and thought worthy to read his books. 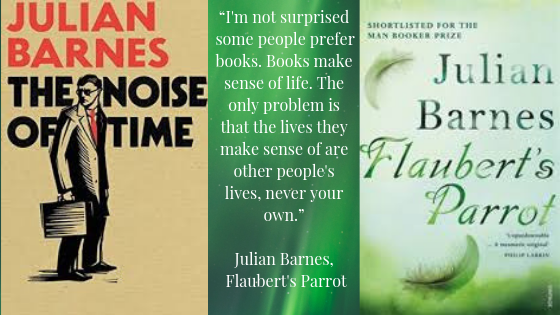 Lately, I have read two of his books: The Noise of Time, a book about the Russian composer Dmitri Shostakovich and Flaubert's Parrot about Gustave Flaubert. A wonderful book about a very talented man, who, all his life, had to fight to compose his own music. Living in the Soviet Union under Stalin, everyone was controlled, dissected and judged. He had his own times of not being a favourite, although he managed to compose the 'right' kind of music in order to be able to compose his own music. The way in which Barnes approaches his subjects gives us a close up of the person. You are there with Shostakovich, can feel his every anxiety, fear and pleasure. It becomes very personal. Barnes do make a lot of research and on top of the facts he manages to put the story of his subjects alive. In this special case it shows how small people are in the face of a totalitarian regime. In spite of everything Shostakovich's music is still alive. Geoffrey Braithwaite is an amateur expert on Gustave Flaubert in this story. He follows in the author's footsteps, especially trying to find out which one of the two stuffed parrots that actually was Flaubert's. This novel is different from The Noise of Time. It tells the story of Flaubert from the outside, from a fan of his. Doing so, Barnes takes the opportunity to use a kind of literature critic on his subject. At the same time, Flauberts actions as he follows in his footsteps, coincide also with Braithwaite's. The story is rather slow, and sometimes a little bit dull. That is to compare to The Noise of Time where the story runs like a small waterfall, unable to stop you from reading. Here, it is easier to put the book down. She was a strong woman in her own accord, married at the time she had the affair with Flaubert. Her salon in Paris was well visited and she lived a rather unconventional life, but still wanted to marry Flaubert. In the background was the ghost of Madame Bovary. Barnes uses "George Braithwaite's Lexikon" to reflect on life in general and the life of Flaubert in particular. The question is; can wet really know other people? There will always be a part that is not understood from the outside. Nevertheless, we are eager to try to understand and get to know the people we admire. Is Braithwaite, the expert, more wiser in the end? Maybe, as he can look at his own life in perspective. Recently, I visited London for a weekend. Always a treat and lots of things to do and see. I had a special aim for this visit, namely, the Edward Burne-Jones exhibition in Tate Britain. 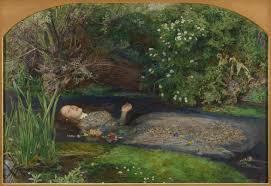 Some years ago I fell in love with the Pre-Raphaelites, and Burne-Jones is one of them. Maybe more diverse in his talents than any of them. "Edward Burne-Jones (1833-1898) was one of the key figures in Victorian art, achieving world-wide fame and recognition during his life-time. As the last major figure associated with the Pre-Raphaelites, he led the movement into new symbolist directions where the expression of a mood or idea replaced the earlier focus on providing a realistic description of the natural world. Using myths and legends from the past he created dream-worlds of unparalleled beauty, balancing clarity of observation with dramatically original composition." Also recognised as a designer, he was one of the founding members of the design collective Morris & Co, for which he designed furniture and stained glass, but he also made designs for tapestry, embroidery, and book illustration. A man of many talents. His paintings are fantastic and cover so many different motives and themes. The exhibitions was well put together in themes and with the audio guide you enter into the world of Edward Burne-Jones. A world difficult to part from. A visit to the museum shop, always a treat in England, is a must. I came out with a book and two post cards that I will use as bookmarks. Unfortunately, no specific bookmarks from this exhibition. 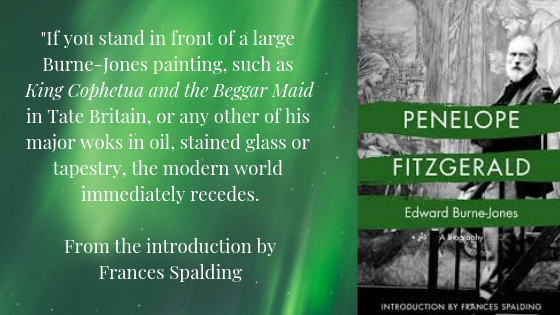 The book is Penelope Fitzgerald's Edward Burne-Jones, A Life. He was married to Georgina, one of the MacDonald sisters. Four of the five of them married into the history of the Victorian cultural age. Juliet Flanders tells their story in A Circle of Sisters. It is such an interesting part of British history. I am happy I managed to see this exhibition, the very last weekend it was on. After the exhibition I ventured up to the 1840s gallery to have a look at the other Pre-Raphaelites, and especially one of my favourite paintings; Sir John Everett Millais's Ophelia. Unfortunately, it was not there. Asking one of the guards I learned that it is on tour for an exhibition in Australia! Lucky you guys, down under! Don't miss it if you have the opportunity to see it. The background to this painting, where Millais used Lizzie Siddal, the girlfriend/wife of Dante Gabriel Rossetti, is quite dramatic. You can read all about it and much more in the very interesting Desperate Romantics, The Private Lives of the Pre-Raphaelies by Franny Moyle. It has also been made into a TV-series. Further interesting reading about this group of artists and their muses are: Effie by Suzanne Fagence Cooper about Millais's wife Effie, who first married the art critic John Ruskin and was stuck in an unhappy marriage. Also made into a movie. I can also recommend a book about the model above, Lizzie Siddal - The Tragedy of a Pre-Raphaelite Supermodel by Lucinda Hawksley. A favourite author + a favourite film = The Third Man. A classic story that I finally got to read, or listen too. I have seen the film of course, one of my favourite. Graham Greene seldom disappoints you, and I think that this might be one of his very best stories. I think most of us think of the film when we hear the title. Green actually wrote first a novella on which the screenplay was based. The story is set in post-World War II Vienna. American writer Holly Martins arrives to meet his old school friend Harry Lime. Upon arrival he receives the news that Harry Lime died in a car accident a few days earlier. He attends the funeral, visited only by a few friends and what turns out to be Lime's girlfriend. Martins is contacted by the British military who ask him questions about Lime's business in Vienna. Martins, quite innocent on the behaviour of his old friend, is surprised by what he is hearing. There is a mystery surrounding the car accident and Martins sets out to try to find out what really happened. That is how he gets to know that there was a third man present when the accident happened. In search of this man he moves around a grey and gloomy Vienna, where he cannot trust anyone. It is very atmospheric, which might be because you have the film in mind, but the novella also conveys the spooky, foggy and mysterious surroundings. 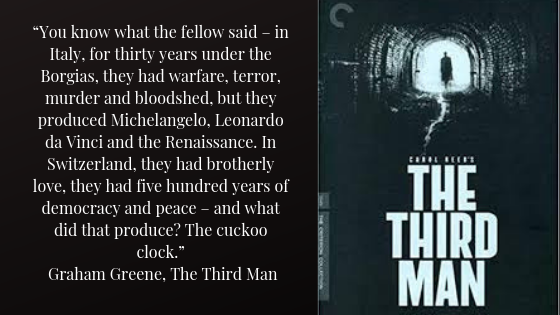 Greene manages as always to characterise very well the ordinary man (it is mostly a man in his novels) falling into circumstances, quite out of the extra ordinary, often related to a world of spies. Martins does find out in the end what is wrong with Harry Lime and it comes as a chock. Has he lost his innocence in his fight to clear Harry Lime's name? From Wikipedia I learn that "in 1999, the British Film Institute voted The Third Man the greatest British film of all time. In 2017 a poll of 150 actors, directors, writers, producers and critics for Time Out magazine saw it ranked the second best British film ever." The film is something special. Don't we all know the wonderful theme by Anton Karaswrote, the good actors and Carol Reed, directing this film noir. The audio book is very well narrated by Martin Jarvis, with a wonderful English accent à la Colin Firth.